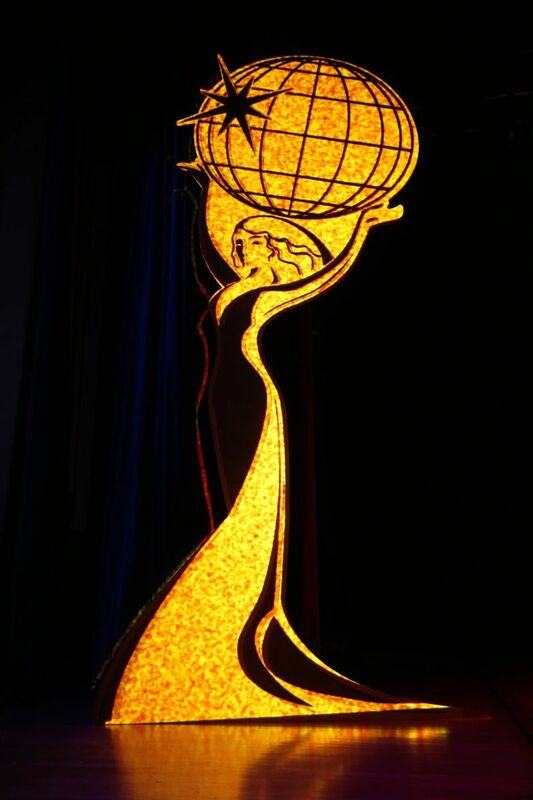 BURBANK, California USA – “The Themed Entertainment Association (TEA) congratulates the TEA Thea Awards recipients, representing some of the finest achievements in the creation of compelling places and experiences,” said TEA International Board President Michael Mercadante of Main Street Design. 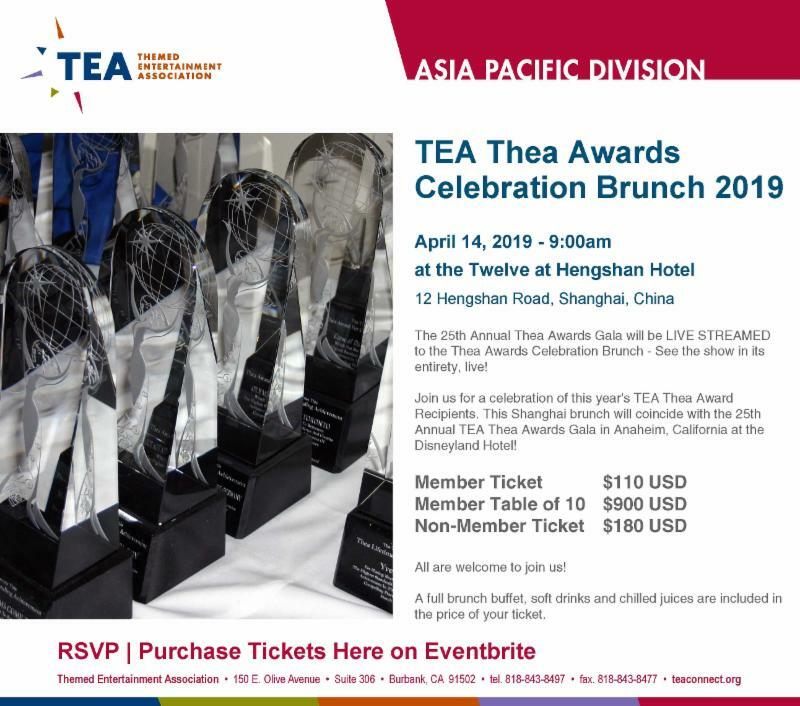 Ticket sales are NOW OPEN for the TEA Summit and Thea Awards Gala, April 11-13, 2019 at Disneyland Resort in Anaheim, at www.teaconnect.org. While the TEA Thea Awards recipients are announced each November, they are formally awarded the following spring. From hundreds of nominations received each year, the Thea Awards Committee deliberates at length to produce the annual slate of recipients, which is submitted to the TEA International Board of Directors for approval. 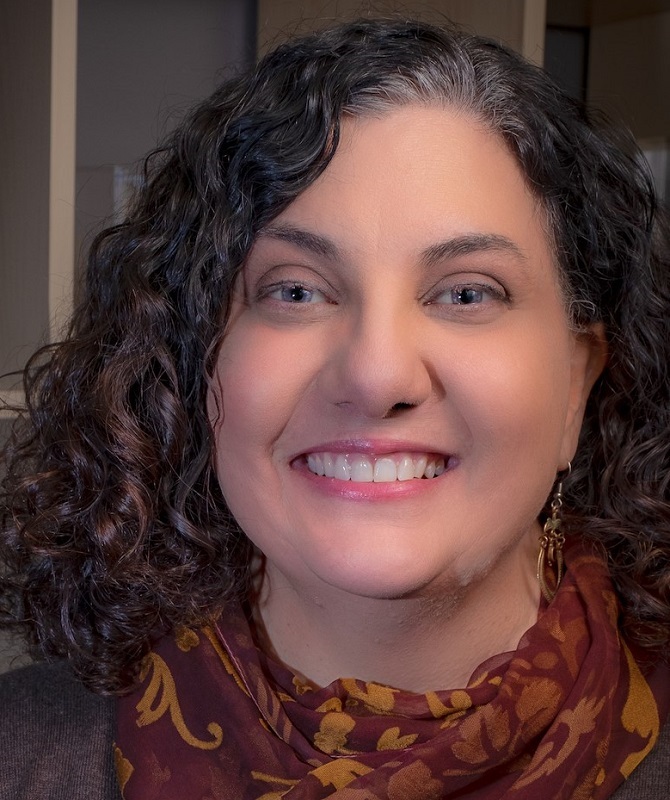 Chair of the Thea Awards Committee for the 2018-19 cycle is Lisa Passamonte Green of Visual Terrain. The themed entertainment industry touches all genres of visitor attractions, internationally - including destination theme parks and waterparks, regional theme parks, museums, visitor centers, resorts, parades, immersive experiences and spectaculars. The industry has exploded globally in the last decade and is significant to international business in terms of travel, tourism, land development, hospitality, retail, entertainment, education, IP and branding, design, architecture and technology. 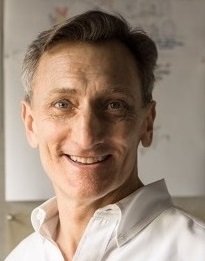 “Mark Woodbury’s leadership, along with a highly-motivated and talented team, pushed technology and storytelling and the Universal brand to an all-new industry standard, translating pop culture's visual and literary mediums into today's most compelling and immersive experiences,” wrote the Thea Awards Committee. During his 30-year career at Universal, Mark has been involved in developing over 60 attractions plus hospitality and retail, at Universal properties around the world. Celebrated accomplishments include the Wizarding World of Harry Potter, Transformers: The Ride, The Amazing Adventures of Spider-Man, Terminator 2: 3D, and Universal's Islands of Adventure. Mark has collaborated with the likes of Steven Spielberg, JK Rowling, Peter Jackson, Chris Meledandri, Stephen Sommers, James Cameron, Shigeru Miyamoto and Michael Bay. 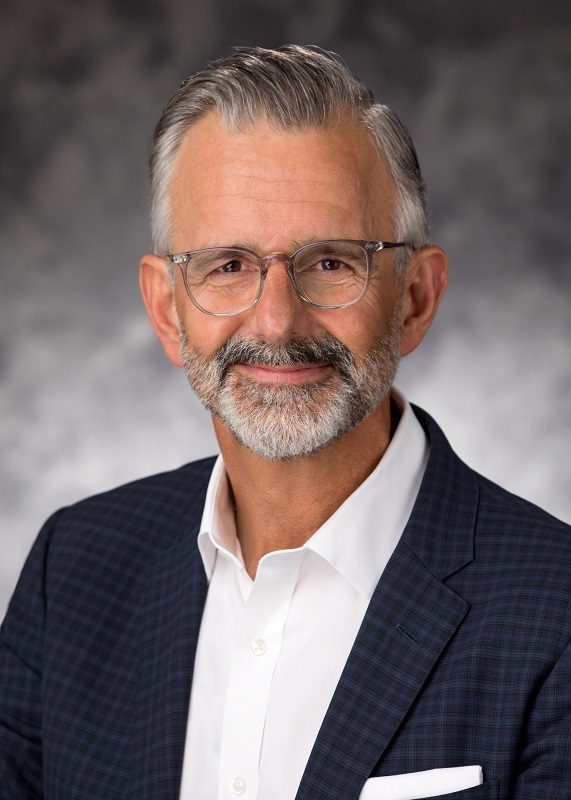 Mark Woodbury will formally receive his Thea trophy at the April 13, 2019 TEA Thea Awards Gala presented by Chimelong. Prior to that, he is the keynote speaker for the TEA Summit: "A Conversation with...Mark Woodbury," April 11. Both events take place at Disneyland Resort in Anaheim. Since 1986, Dollywood has been owned and guided by country music superstar Dolly Parton and Herschend Family Entertainment. This 150-acre theme park began as Rebel Railroad (1961-1970), then Goldrush Junction (1970-1976), and Silver Dollar City Tennessee (1977-1985). 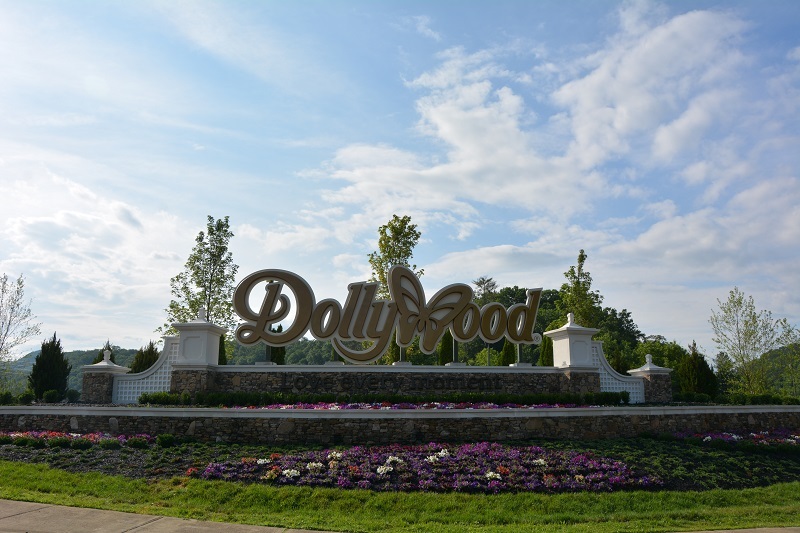 Today, visitors from across the country and around the world flock to Dollywood to experience its 10 themed areas (the 11th, Wildwood Grove, opens in 2019) and enjoy the local culture. There are more than 40 attractions within the park, complemented by high energy entertainment, dining and retail. 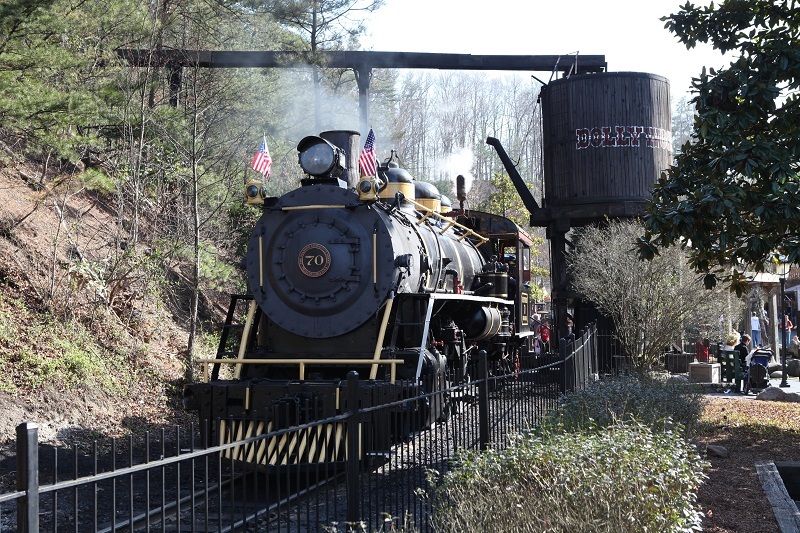 Dollywood lives up to the Herschend motto of “Creating Memories Worth Repeating®” with a blend of thrilling rides, spectacular shows, master craftsmen and heartfelt sincerity in the best traditions of the Great Smoky Mountains region where it was born. Most important, at every point of the visitor experience, guests encounter employees with a genuine interest in the guest’s experience, delivering what is arguably the highest level of authentic human care and heart of any park in the world. At the TEA Summit (Day One, April 11), Pete Owens (Vice President of Marketing and Public Relations, The Dollywood Company) will be featured speaker in a session moderated by Christine Kerr. Two days later (April 13) at the 25th Annual TEA Thea Awards Gala presented by Chimelong, the Thea Classic trophy will be formally bestowed. 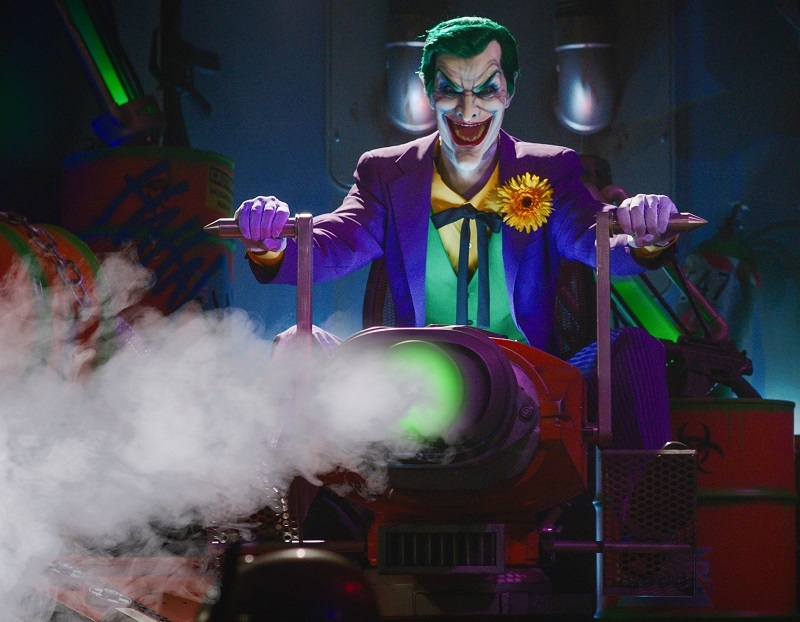 This unique attraction introduces interactive, dark-ride storytelling to an emerging theme park market (Poland) and builds on a unique and local cultural context. Bazyliszek uses modern storytelling tools and immersive environments to explore the myth of the Basilisk – a reptilian monster, part serpent/part rooster with magical powers and a deadly glance. In the Monster Hunters Guild mansion, in the Magical Forest zone of the park, guests are enlisted to go to the village of Kurkowo, battle the Basilisk and free the village. The queue experience is a walk through the Guild Hall, Hall of Fame, Research area, Weapons room, and finally a Briefing room where guests are asked to help in the hunt by Flora, a Monster Hunter herself. Guests board Monster Hunter vehicles and use shooting devices in a fierce and fun battle to disarm carnivorous plants, find the Basilisk and defeat it. The attraction uses a full range of tools to deliver this story and experience: targets are in the media on screens that are integrated in show sets, as well as on moving show action elements, and into black lighted sets. The media extends the show sets, and elegantly continues the story and the village, and bring the characters to life in a fun, energetic way. Despite its limited means, the attraction is a complete story with a full queue, preshow, video presentation, dedicated load, interactive ride across multiple scenes where theming bridges well across gaps, and even includes scores shown in a guild book at the end. Using a Polish myth as a basis for its story is a great match for its audience. Delivering an attraction that is well integrated in its cultural context, but that manages to deliver a compelling modern and fun experience is not only remarkable, it is also a great alternative to major IP offerings. Bazyliszek is an outstanding model of an attraction that speaks to its regional audience. It is well-executed, elegant, engaging, colorful, fun and fresh. 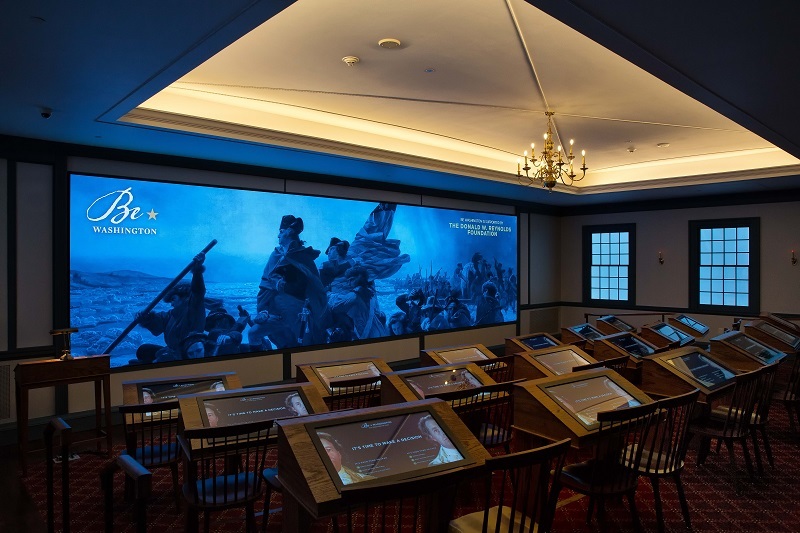 In this new first-person, interactive experience, visitors face crises that Washington faced in his presidency (four possible scenarios), hear from advisors and choose a course of action while on the clock, then learn how Washington himself acted. In a period-looking space equipped with state-of-the-art gaming kiosks, actor Chris Jackson (George Washington in “Hamilton”) appears onscreen to introduce the topics. The room design, inspired by Congress Hall in Philadelphia, contains 18 two-person kiosks. Theatrical windows on the left and right of the theater change in color to suit the topic and mood of the scenario. Gamification meets edutainment meets Theater! Engaging, entertaining and highly educational! In addition to welcoming everyday guests, the “Be Washington” theater can be used to host education, leadership, corporate, and governmental groups for custom facilitated sessions with Mount Vernon experts. The large 6K screen includes a picture-in-picture capability that allows the facilitator to present additional information to further flesh out the topic and facilitate discussion. "Be Washington" is an excellent example of bringing historical education to life in a present-time environment. 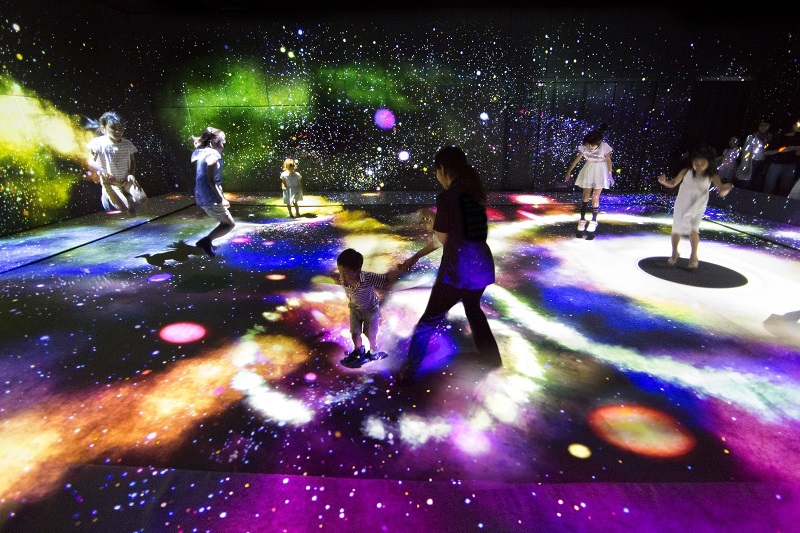 Japan’s famous art collective teamLab, in collaboration with local urban landscape developer MORI Building Co. Ltd. created this permanent experience showcasing more than 50 interactive digital artworks in 5 different zones over 100,0000 square feet, and already a ‘must-see’ attraction for anyone visiting Japan. The museum is designed for people of all ages and cultures. The experience is beautiful and accessible to guests, whether tech-savvy, digital art lovers or new to digital art. The main objective is to create interactions between guests (jumping, climbing, touching, etc.) with a sense of total immersion. The playfulness of many of the exhibits removes the ‘seriousness’ of the ‘digital art’ and encourages these interactions, helping to bring out the 'child' in everyone,’ catalyzing moments of fun and joy. This exhibit is a great example of a well-balanced and structured, fully immersive experience, without complex instructions or recent technologies (no wearables, motion theaters, VR, AR, or 3D glasses). The simple, yet innovative combination of analog interactive installations and advanced projection mapping visuals equals a world-class, non-linear entertainment experience that allows visitors to explore, wander and discover at their own pace. It maintains a ‘Japanese’ touch with many local culture and nature references; for example, the interactive Tea Ceremony room. The level of technical complexity (520 computers / 470 video projectors / interactive sensors / etc.) and the overall quality of the experience, makes ‘Borderless’ a new reference point and potentially a game-changer in the industry. With his famous motorcycle stunts and jumps, Evel Knievel entertained kids and adults throughout the late 1960s and into the 1970s. 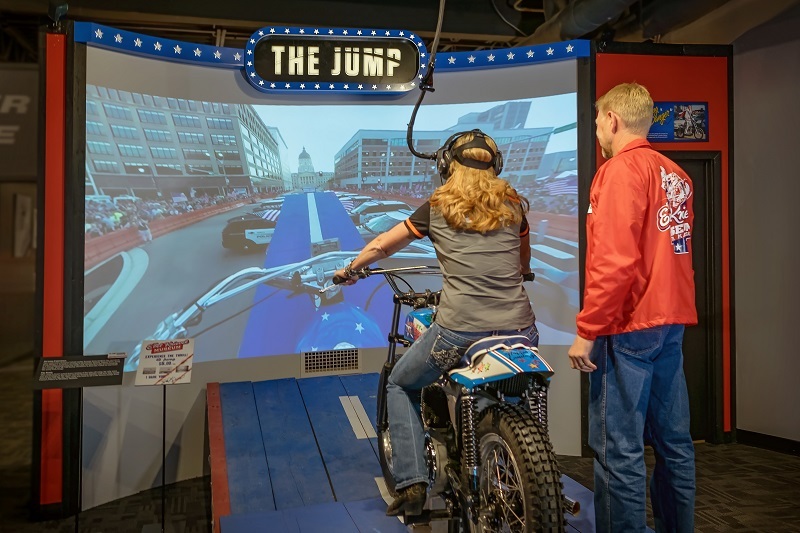 This museum is a sincere, respectful tribute to Knievel’s high-adrenaline career, fearlessness and humor, and the love that people still hold for him. It is created with great respect for Knievel's fearlessness and an appreciation for the humor he brought to his stunts, which were always clever, clearly dangerous, and compelling to watch. The museum is a two-story building in Topeka, Kansas which sits underneath the Historic Harley Davidson, just south of the Kansas Expocenter. The first floor offers an historic timeline and a collection with many of his unique cycles, fancy leathers, a movie theater and the lovingly restored “Big Red” Mack truck Evel used to transport his show. The TEA Thea Awards Committee gives The Evel Knievel Museum high marks for creative staging and production, unique storytelling and great guest experience for all ages. entertainment technology: LED and projection mapping, programmable costumes and scenery, immersive audio and lighting design, and a unique, autonomous indoor drone show. It reflects Princess Cruises’ in-depth understanding of their market’s tastes, style, and preferences, combined with a high sensitivity to the need for best-in-class leisure experiences. A theater at sea has special maintenance needs. In the case of Fantastic Journey, the ever-changeable ocean means that each show (and constantly throughout each show) the flight of carefully choreographed light-source drones must be monitored and adjusted. That’s what happens in the astonishing complex performance of “Rise” midway through the evening. And this jaw-dropping number is just one in an evening of awesome live entertainment and outstanding spectacle. After a build-out in Montefalcone, Italy, the Majestic Princess set out on her maiden shake-down cruise to various Mediterranean ports and headed on to Shanghai while on-board, the production team assembled by Princess Cruises set up, tested and rehearsed the show. The premiere of Fantastic Journey in Spring 2017 was, of course, nothing short of fantastic. enhances the Fantawild brand with its special mix of traditional Chinese culture and technology-driven attractions. 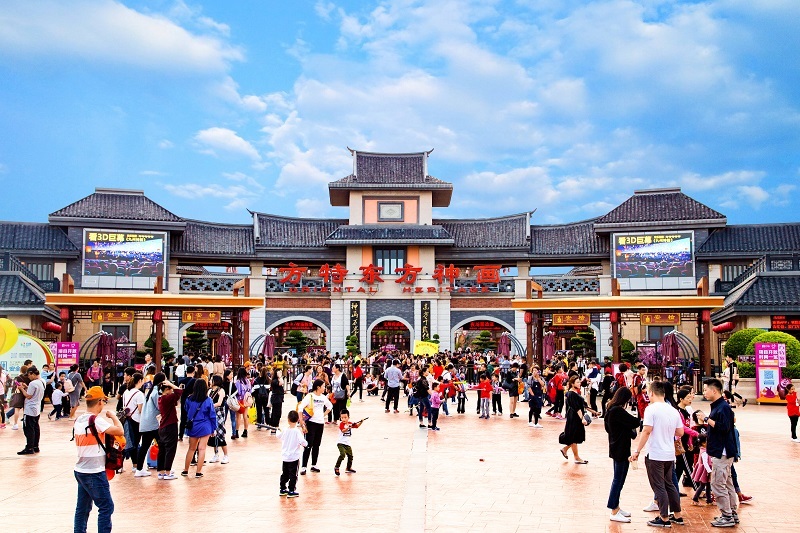 With nine thematic areas, 12 major attractions and a cultural heritage town, the park presents thousands of years of rich Chinese history, culture and folktales, enhanced by traditional architecture, classic food, and live entertainment. The attractions were developed primarily in-house by Fantawild animation and special effects units. 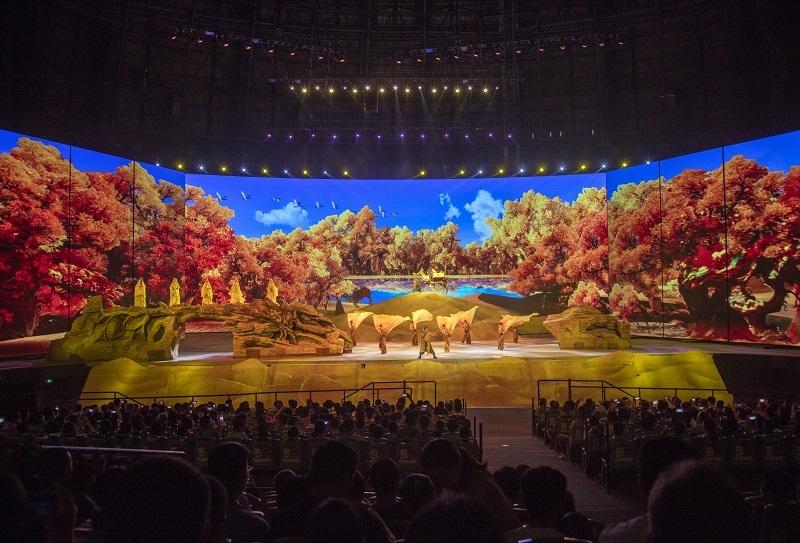 Throughout the park, these and other attractions, along with amazing performances and powerful characters, combine to bring China’s storied cultural history to life in a unique environment that is a break from traditional theme parks or live theatrical experiences. Oriental Heritage brings together an exceptional blend of live entertainment, large-scale shows and engaging dark-ride experiences. It successfully couples technology-based immersive experience with the rich folklore and culture of China, to deliver a truly unique and compelling family destination. 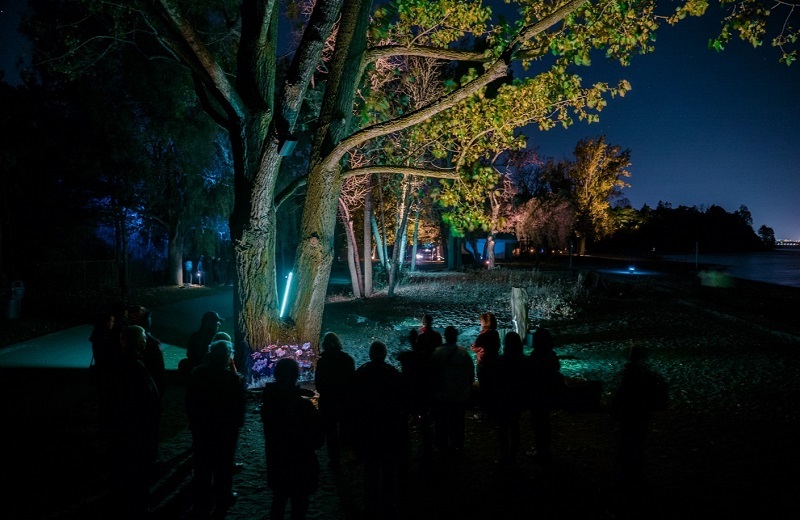 This unique collaboration featuring the work of Canadian artist Sarah Fuller is a magical, nighttime, digital discovery experience. The experience was offered and tailored to two different national parks. These parks have a rich history to explore – not just geology, but also the ecological impacts that have created what surrounds guests today. The team wanted to make these narratives visible without impacting the environment, but also wanted to demonstrate how their multiplicity and continuity shapes the landscapes and wildlife ecosystems. In this case, the show equipment (gear) used both revealed the story and became a metaphor for the story. The team sought a ‘leave no trace’ approach and the entire operation was designed to be battery-powered and portable. The experience starts at night, with guests exploring in teams. They have been outfitted with multimedia tools disguised as camping gear, that activate along the way to illustrate story points, trigger video, special effects, music and voiceover, revealing wildlife and history within the parks. From salmon swimming up the Rouge River to a submerged town of Lake Minnewanka, each moment is a combination of multimedia effects and encouraging audience participation to work together to bring these stories to life. Illuminations: human/nature leverages the magic and storytelling impact of the digital tools of our industry while being respectful and aware that the majesty of our national parks and environment must be preserved. It invites participants to consider the real lack of boundaries between humans and wild nature. 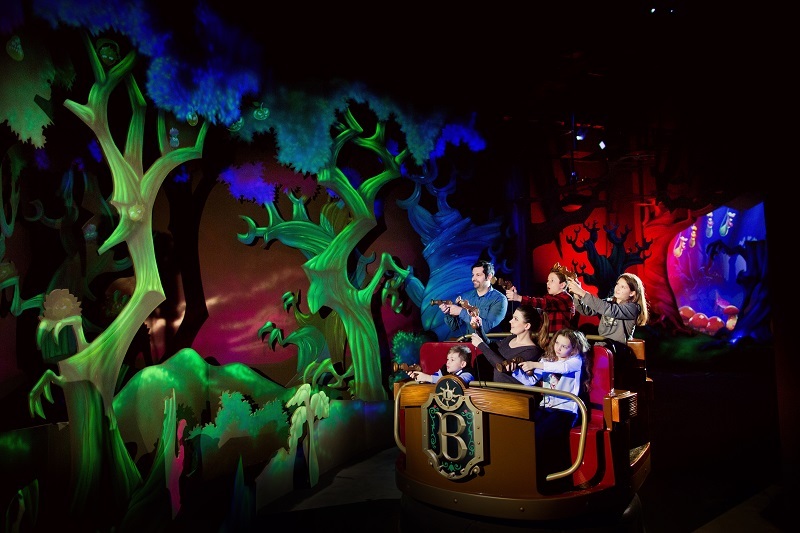 This story-driven adventure for guests of all ages blends dimensional and animated sets, animatronics, 3D video, special effects, projection mapping, laser stun-blasters, interactive targets, a scoring system, a musical score and more aboard custom motion vehicles. Narrative-based, full immersion storytelling is an impressive new direction within a park system better known for iron rides - while staying true to the Six Flags brand. Participants are plunged into convincing illusions simulating the dynamic movements emblematic of other Six Flags attractions, including a vertical loop, a corkscrew inversion and other thrill movements. These are cleverly achieved without the need for height restrictions. Thus, the experience can be safely shared with everyone from younger siblings to grandparents. Continuous improvement is how it ought to be. While this Thea Award honors the installation at Six Flags Magic Mountain, with the JUSTICE LEAGUE™ attraction in seven parks since 2015, Six Flags and their team have achieved a commendable, constant trend of artistic and technical improvements and set an example for the industry. With each installation it gets better, artistically and technically - raising the bar in all aspects, all while staying within a business model and cost structure appropriate to the park's attendance and market. And the result is both a documented crowd pleaser and attendance driver. Shouldn't it always be this way? This is the TEA’s opportunity to reward what we would like to see at every economic level of our industry. 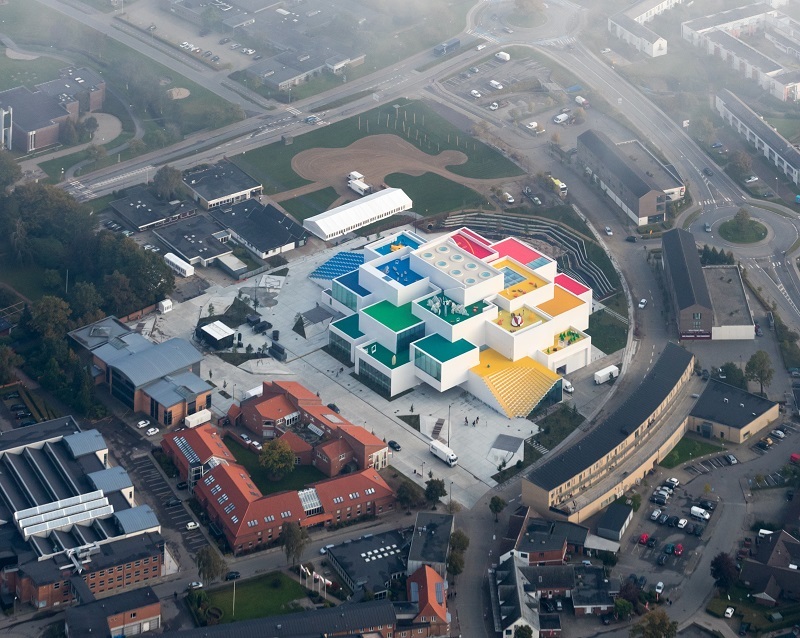 LEGO House, located in the Danish town of Billund, where the iconic LEGO brick was invented, is an immersive brand center where children and adults of all ages can explore their creativity and discover the endless possibilities of learning through play. experience with family and friends. Creative and engaging play has been at the very core of the LEGO philosophy since its inception. All the activities are designed to foster learning through play and advance childhood development through immersion and engagement. At LEGO House children play with a system that combines structure, logic and creativity where all bricks can be combined in countless ways allowing them to be endlessly creative in expressing their imagination. This process stimulates vital skills like communication, empathy and problem solving, which benefit children throughout their entire lives. All of this is achieved in a seamless manner that is the iconic brand of LEGO and occurs in a bright colorful playful environment for the entire family. This immersive ride experience is based on the Disney/Pixar films Finding Nemo and Finding Dory. Guests board a “SeaRider” submarine which shrinks to the size of a fish. The video interactions with the spectators showcase the beloved characters Nemo and Dory and many of the other popular characters from Finding Dory including Destiny, the whale shark, and Hank, the octopus. Each of the two theaters utilizes the same motion simulator system as its predecessor, StormRider, which includes a combination of motion and visual effects. In addition to the all-new story and media are a new exterior theater façade, a new pre-show and a more refined immersion experience inside the simulators. Even without 3D glasses or a complex theater, the team found the perfect balance of elements to make this a charming and exciting ride for the whole family. Each experience is unique, composed live with more than 576 different video clips that create different storylines for each ride. The attraction is beautifully executed and subtly transformed; it does not feel like a repurposed ride. The immersion effect composed of video and motion is perfectly balanced, providing the guests with a feeling of riding in the water and plenty of surprises and action to entertain. Nemo & Friends SeaRider is a beautiful example of taking a good attraction and making it even better. 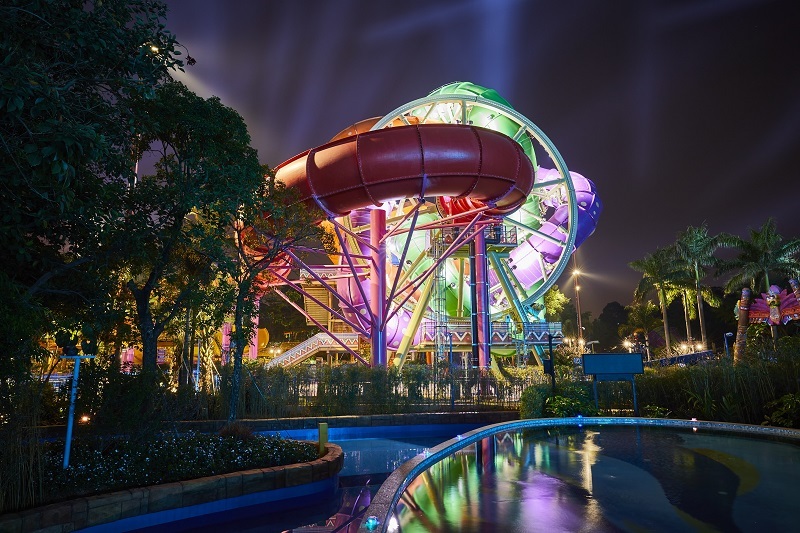 As a huge, moving, iconic feature within Chimelong waterpark, SlideWheel is visually stunning and becomes a major part of the nighttime experience for spectators and passengers alike. Viewers watch the spectacle as the 24-meter-tall SlideWheel rotates, while providing an immersive water ride to passengers, with thrills unique for a water slide. This includes swinging motions and zero gravity. Up to 480 passengers an hour slide through, loaded into four-person rafts that are moved into the SlideWheel every 30 seconds via an automated conveyor. As a raft is moved into the slide, at the central rotational point, the raft begins a 3-minute slide within the SlideWheel. A total of three rafts can be riding inside the SlideWheel at any given time. Combined with a light show achieved using more than 700 LED lights on the interior and exterior, the SlideWheel is a mesmerizing attraction for all. SlideWheel is a highly engineered and innovative achievement that provides guests both visual and physical sensations that are unique to the waterpark industry. This live spectacular is Chinese legendary epic storytelling, of travelers on the Silk Road crossing China all the way to ancient Rome during the Tang Dynasty (618-907) encountering extreme weather, life-threatening dangers, and fantastic sights. Legend of Camel Bells wows the audience with stunning stage effects, massive props, extreme scenery, a huge cast, animal actors, a 15-meter-tall volcano and snow mountain, 18-meter-high Buddha and 20-meter-high by 40-meter-wide waterfall - all dramatically presented on the massive, oval-shaped stage, backed by a 4,000 square meter LED screen. The adventure is continuous as the 3,000-person, raked audience platform rotates seamlessly from scene-to-scene. Not only does the platform rotate, it tracks back and forth from the action to provide a more intimate or larger stage area as required for the scene. 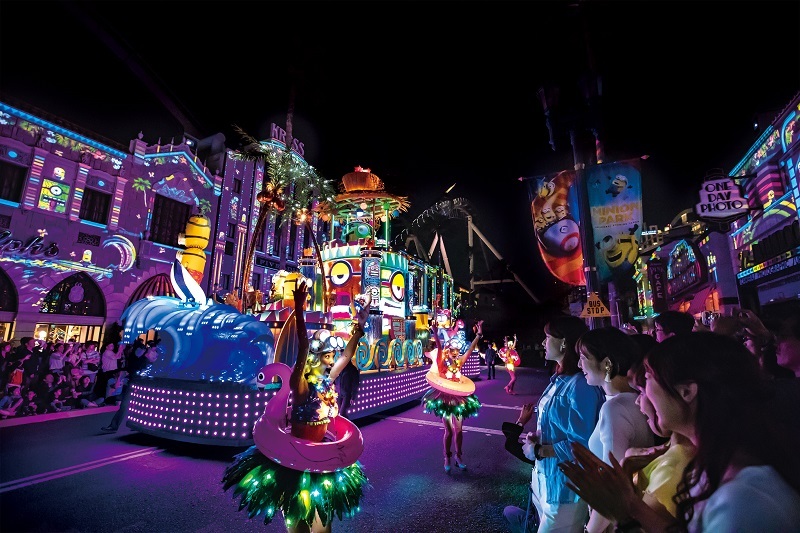 Theme parks have, over the decades, explored ways to expand upon the nighttime parade spectacular and Universal Studios Japan has dramatically reinvented the stage on which their nightly pageant performs. The memorable characters, settings and music from Harry Potter, Transformers, Jurassic World and Despicable Me “Minions” provide the basic foundation for this achievement. Universal’s goal was to immerse guests in an experience rather than merely have them view it from the sidelines. As each scene winds its way down the parade route, elaborate yet subtle background settings transform environments all around into carefully extended worlds in which the characters and props passing through inhabit and reside - from prehistoric worlds and science fiction, to live action fantasy and cartoon towns. The stories come to life in a multitude of ways. Characters move on and off the moving set pieces. Animatronic and costumed characters make fantastic beings real; while supporting filmed characters appear within the mapped background environments. The movements of a large cast of live performers align with the projection and technical elements. A new parade control system had to be invented to synchronize onboard and off-board projection mapping with the progressive movement of parade units, choreographed to a musical score. With absolute precision, the massive, virtual environments synchronize with puppeteered creatures and live performance to achieve near-total guest immersion with characters, settings and music. The result really does let guests "live the movies." Volcano Bay is the third theme park to open within the Universal Orlando Resort. This Polynesian-inspired, water-themed park consists of four distinct villages, 18 attractions, six restaurants, retail, real sand beaches and the 200-foot-tall Krakatau Volcano. Guests can enjoy all Volcano Bay has to offer without standing in lines or carrying personal flotation devices, thanks to the revolutionary Tapu Tapu bracelets. The entire park beckons with the promise of escape, relaxation and adventure and lives up to the belief that ‘Water is Life and Life is Joy.’ Once inside, guests are transported to a quintessential tropical island paradise that’s every bit as exciting or serene as they wish. Guests can float along the Kopiko Wai Winding River, play in the waves of Waturi Beach, ride the Krakatau Aqua Coaster and experience a 125-plunge speed slide, racing slides, body slides and the TeAwa raft ride. Island-inspired dining and shopping are featured in the park. The revolutionary Tapu Tapu bracelets entitle guests to all privileges and conveniences of the island including: virtual queueing, cashless transactions for lockers and cabanas, to view and purchase photos captured throughout the day and enjoy dining and retail, all with just a tap of the wrist. They can even use Tapu Tapu to unlock some island magic all around the park. 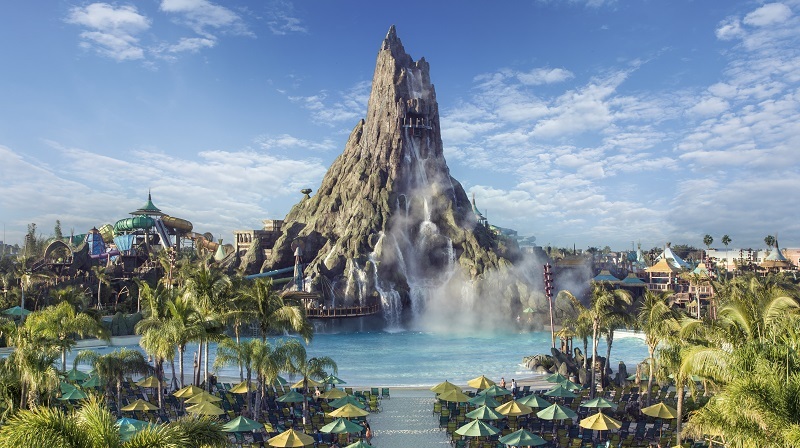 Volcano Bay truly merges a water park and a theme park into something representative of the high standards of our industry, and raises the bar for water parks in general. of 500 drones during an Independence Day celebration July 5, 2018. Developed by Intel’s Drone Group, the technology for the unique Shooting Star Drone System is an innovative design and engineering solution for aerial light shows. This drone mass flight system (for both indoor and outdoor shows) is controlled by one computer and one operator. This technology was specifically developed by Intel’s Drone Group, inclusive of both the unique Shooting Star Drone and the software and technology necessary to control the complexity of mass drone flight with precise, reliable and safe control and choreography of extremely large numbers of drones. Each Shooting Star Drone is exceedingly lightweight (300 grams); each provides a moving point of brilliant light with virtually infinite colors (more than 4 billion color combinations from built-in LEDs). With the software and animation interface of the system, a light show can be easily created in a remarkably short time. 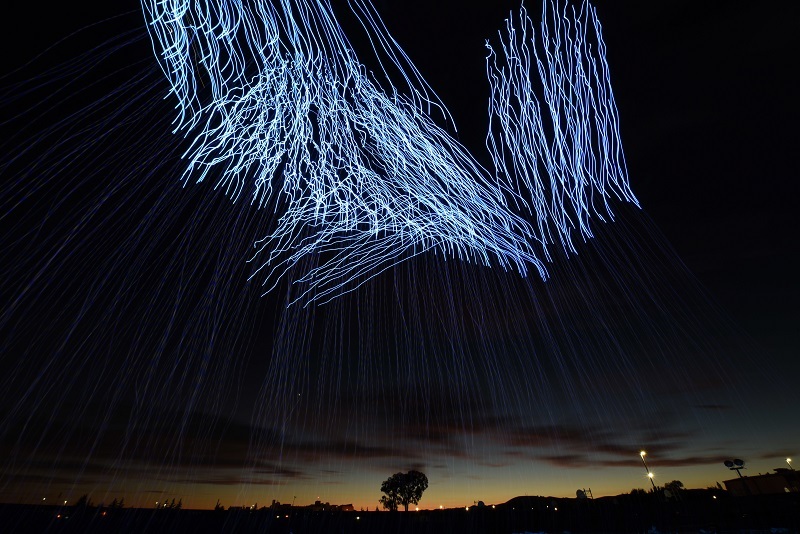 Intel’s proprietary algorithms automate the animation creation process by using a reference image, quickly calculating the number of drones needed, determining where each drone should be placed and formulating the fastest path to create an image in the sky. Employed in the PyeongChang 2018 Winter Olympic Opening Ceremony, 1,218 drones set a new Guinness World Record for most drones flown simultaneously. 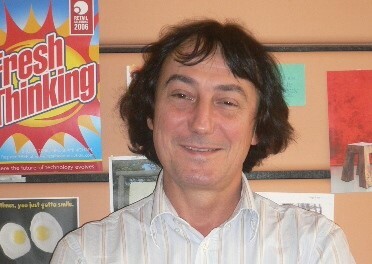 Michel joined the TEA in 1999 and has been an active leader since then. He has served on the TEA International Board of Directors in addition to multiple terms on the TEA European & Middle East Board. He has focused on helping to develop TEA’s presence and define its role in the European market, and more recently the Middle East market.